This short play (roughly half an hour in length) provides a humorous portrayal the worst aspects of men and women, respectively. 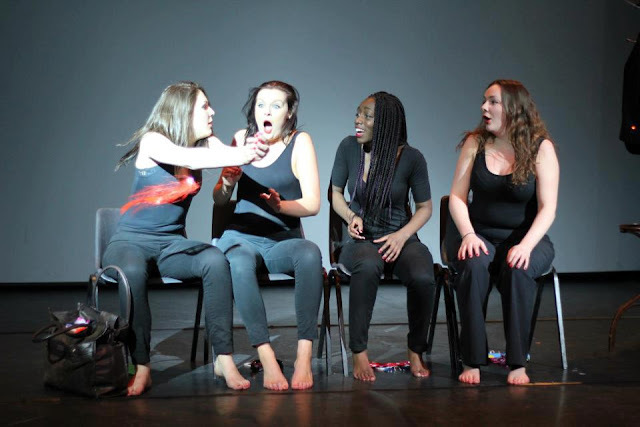 An all female cast, these four young women approached their performance with energy and humour. Opening with the four of them miming traditionally female activties - cooking, sewing, and looking after a child, all to the soundtrack of their sighs - I was impressed by the careful choreography of their movements. The piece relies on physical theatre and dance, and the actors proved their ability to deliver this. The company made great use of the men's jackets as their swoons and sighs built to an exaggerated crescendo. This over the top acting makes for a piece which feels deeply satirical. Then all of a sudden the group don the jackets and become men, communicating in grunts and inarticulate noises, while simultaneously crotch-grabbing and winking at the female members of the audience. The men and women presented in this show are caricatures. However, whether it's the woman seen strutting her stuff in her high heeled shoes, or the men who follow her with their tongues hanging out, I was struck by how perceptive the piece is. I recognized the stereotypes this company were mocking. The music choices really worked and there was creative use of lighting. My only real criticism is that I would like to have seen a longer, more developed version of [WO]MEN. That said, Blah de Blah are a young company fresh out of university, producing something intelligent and original. Long may it continue. This review was first published in Wildfire, the daily critical review for Exeter Ignite Theatre Festival 2013.